Fred Cole’s falsetto is truly something to behold. 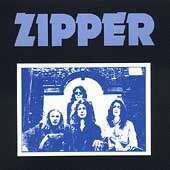 In 1975, the longtime DEAD MOON frontman was fronting a bombastic, R&B-influenced metal/psych/boogie combo called ZIPPER, a band so heavy and rocking that they often bordered on Spinal Tap territory. Cole’s falsetto – I don’t think I can ever really get used to it. It’s so raspy and womanly, you get the sense that there’s some underhanded comedy involved in his delivery, like he knows how preposterous he sounds but he’s gonna do it anyway for fun. Remember that awful Seattle pre-grunge group “MALFUNKSHUN”? That guy, “Landrew”, had the same sort of rawkin’ moony falsetto, though I doubt he was kidding – he’s the guy that went on to front “Mother Love Bone” (see the Worst Band Names of All Time post, below). Anyway, ZIPPER were one of Cole’s many bands on the road to Dead Moon, a road that started in the mid-60s with the LOLLIPOP SHOPPE. Their one and only S/T album is a pretty fun listen, in a smirk-and-rock kind of way. Lots of talk about bein’ on the road, gettin’ laid, a ballbustin’ woman – all backed up by this wacked-out set of howling guitar solos, thumping “We’re an American Band”-style bass, and heavy-heavy-heavy pounding drums. One track in particular is out of sight & a must-own: “Born Yesterday” is a screamer, total mid-70s longhair swamp metal that’d make BLACK OAK ARKANSAS wilt and tremble. The opener, “Bullets” is a little too fon-kay for me, but it’s so packed with bad sexual double entendres that you just have to laugh. The rest is certainly entertaining, while just as easy to mock and mercilessly ridicule at the same time. I used to see Dead Moon play a bunch in Seattle in the late 90s, and some of the wild, seen-it-all fiftysomething bikers that used to follow them up from Portland looked like they’d been smoking bongloads and beating up new wavers with Cole since the Zipper days. Their can-do spirit and general joie de vivre surrounds this crrrazy record!